Mine are like in this image. No springs. Totally manual. Pull the chain one way, they roll down. Pull it the other way, they roll up. They work beautifully, and by having them wider and longer than the window opening they shut out all the light. Well, 98% of the light, I'd say. Mine have a metal cover at the top that hide the little gear shown in the upper left of this photo. Those look nice! Maybe when I get tired of the blinds, which may be soon, as guests do break these as well by trying to raise or lower them after jamming them open. Thank you for posting this. I have seen this type and wondered how well they held up. Is the chain metal? Where did you get them? Mine cost a fortune from a local window treatment specialist, over $7000, installed, for the whole building. But I have some huge windows, some 7' x 12'. All mine are custom made to fit every window in the place. The brand is Hunter Douglas and they have a lifetime guarantee. I think you can get them from places like Lowes and Home Depot, probably for a lot less than I paid, but I felt obligated to buy local since the window lady has the store adjacent to my guesthouse and she put up with a year of construction noise without complaint! There are LOTS of material choices. Some of mine are a suede-like material and others have kind of a wicker look. My chains (a continuous loop held tight by a "tensioner") aren't the typical metal chains like the pull chains on a ceiling fan. Mine are heavier, larger, and they feel like a hard plastic rather than metal. Thanks for the info. Luckily we won't have to do all 81 windows! I know they cost a lot but if they work it will be money well spent. I like the look of your material. No local sources here...will check out the big box stores..thanks again. If you are a member of the closest cost club, they offer these as part of the in-home decorating service. I changed to blackout drapes. No one knew how to use the roller shades or broke them. The venetians always collected dust that was too hard to clean. The drapes just work. I use a double rod or a lay short rod and long rod. I use ties to hold them back, people don't know how to use those either, so we want with permanent tie-backs. Solved the problem. I also use drapes and the brass hold-backs. Makes it easy for all. I use the cheap curtain rods (drapes with pockets, not rings) since they are not being pulled open/closed, it does not matter. I have double curtain rods because I have sheers at all the windows. So far (knock on wood) no rods have been pulled down. The hold-backs get a bit loose from time to time and we were able to fix the one that got broken. Blinds. I changed from roller shades because no one knows how to use them. They would get so wound up they would pop off and hit me on the head. I have the honeycomb shades on my own windows and they don't block light at all. Plus, they fade and get dirty and the can't be cleaned. Blinds were all the rage back in the day! I did get interior shutters for the lower half of the windows on the suite for the windows that open onto the porch. I did think about the wooden look blinds, but do they actually black out or only "darken"? No magic products out there I guess...thanks. Pretty dark. But I also have drapes on the windows, too. Am amazed how dark it is with both closed. Also, you do want guests UP and out! 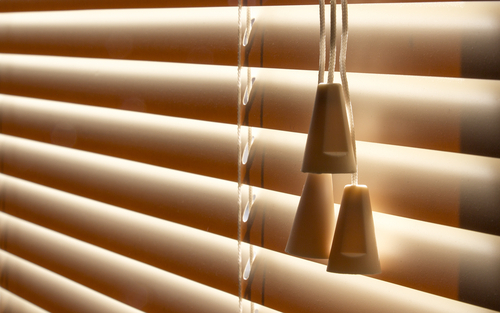 We have black-out roller blinds with just a pull cord, no spring. Seem to work fine, no guest problems.